For the schema created within an Application Begin/End block, you should see 'YES', 'NO', 'NO' for these columns. DBA_USERS does not indicate which Application created the user, but USER$.SPARE10 column has the Application ID of the Application that created the user. In this article, I will demonstrate how we can identify common application users associated with an application using the USER$.SPARE10 column. 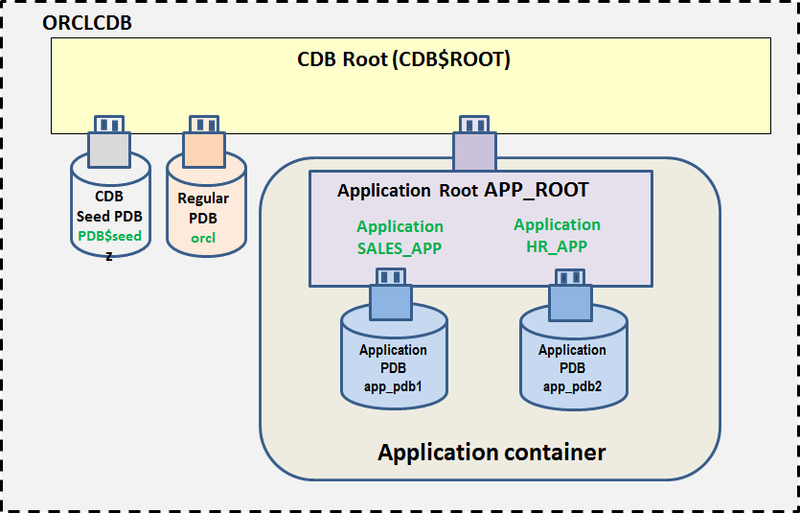 Let us first connect to CDB orclcdb and verify that there is a regular PDB orcl, and an application container app_root in this CDB. Connect to application root app_root and note that there are two application PDBs app_pdb1 and app_pdb2 associated with it. Besides an implicit application, two other applications sales_app and hr_app are currently installed in this container. Let us find out the common application users created in application root app_root. From the output, we learn that there are three common application users in application root app_root but it is not possible to identify which application user is associated with which application, as there is no application-related column in data dictionary view DBA_USERS. However, in the base table user$, the SPARE10 column has the application ID of the application that created the user. Let us join dba_applications with USER$ to find out the mapping between common application users and applications. Now, we learn that the users sales_app_user1 and sales_app_user2 are associated with the sales_app application and the user hr_app_user is associated with the hr_app application. Thus, the undocumented column SPARE10 of data dictionary base table USER$ can be used to identify the application which created the application user(s). An Oracle multitenant application container can house multiple applications. Each of these applications can have common application user(s) associated with it that are created as part of the application install/upgrade action. It is not possible to identify common application users associated with a specific application by looking at DBA_USERS, as it does not have any column indicating the application. We can identify common application users associated with an application using the USER$.SPARE10 column which stores the application ID of the application that created the user.